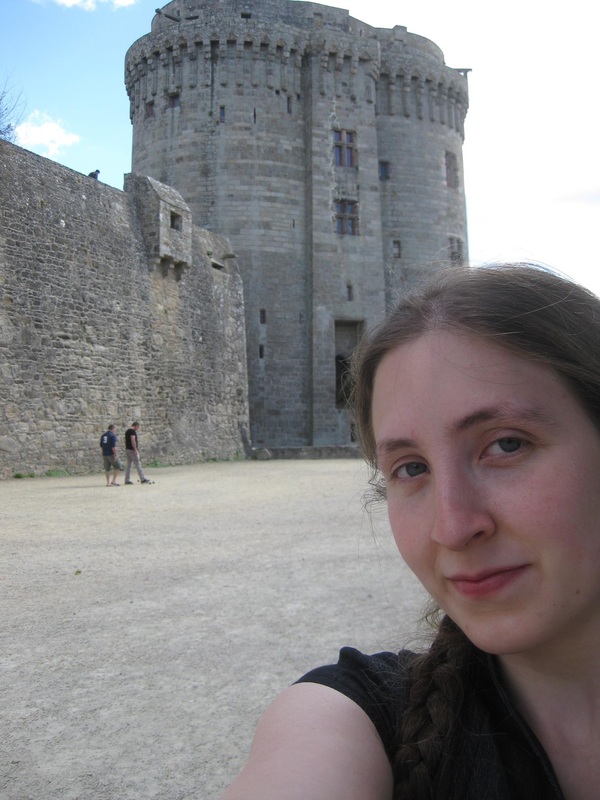 Erika Graham-Goering is a historian of fourteenth-century France (especially Brittany, Normandy, and Languedoc). She completed her PhD at the University of York in 2016 and was the winner of the Society for the Study of French History’s Ralph Gibson Bursary in 2015. She is currently a postdoctoral researcher on the ERC-funded project Lordship and the Rise of States in Western Europe, 1300–1600 at Ghent University. You can find visit her personal website to find out more about her career and research. My thesis (completed under the supervision of Craig Taylor) was a case study of the duchess of Brittany Jeanne de Penthièvre (c.1325-1384) and what her career can tell us about the flexibility of princely power. Though she hasn’t been studied much, Jeanne had a dramatic life: she was intended to inherit the duchy from her uncle, but was ultimately challenged by other relatives, leading to more than twenty years of active warfare and (after she lost) another twenty of some intense intrigue and the occasional rebellion—pretty much the works as far as late medieval politics was concerned. I pulled apart her exercise of power to see how different types of authority fit together even in a single person’s life, particularly where these are often viewed as dichotomies. For instance, scholars have often been interested in measuring princes according to the degree which they mimicked kingly behaviour: were there other models a prince could follow? Was there anything particularly distinctive about noblewomen’s power in relation to that of their male counterparts? How and why was authority restricted to a single individual, or alternatively, viewed more collaboratively? To get at these issues I looked at how Jeanne’s surviving administrative records described her role, the balance of power between her and her husband Charles de Blois in different aspects of government, how she tried to position herself as the legitimate duchess and how her posthumous reputation developed in later commentaries. I argue that these areas were all cross-cut by the influence of multiple, co-existing social norms and that, rather than adhering to any absolute standard, effective power had to respond to contextual circumstances and interests. This not only reflects the complexity of medieval political society, but affects how we talk about rulership now: goals and outcomes that seem clear in hindsight weren’t always as influential on the spot. I think I’ve always been a medievalist—I have no real recollection of how this drive came about, but by the time I was 13 I was asking my mom if I could go to “medieval summer camp” (answer: yes) so clearly it had already set in. My interest in France specifically was a combination of academic and non-academic interests. Growing up in a French-American family meant French history was always there in the background, as well as giving me the language skills to make French sources an option for me when I began my undergraduate degree at Grinnell. While in search of a topic for my final-year research project I happened to visit the beautiful castle at Dinan in Brittany and so discovered the Breton War of Succession, which ended up providing me with material for the next six years instead (and I’m not done with it yet…). There’s also a particular dimension to working on medieval France, that in many ways the French and English historiographical traditions haven’t been in dialogue as much as they might be, so there’s a lot of space for bringing ideas together in new ways. I also just love working with early French texts; at York I started the Old French Reading Group to share my hobby of translating all sorts of genres and dialects from the period (as well as my other hobby, baking). Now that I’m also working on southern France, of course, I’ve had to add Occitan into the linguistic mix to keep things lively! I always held part-time jobs during my studies, first at my college library and, once I was in York, at several of the local museums—the Jorvik Viking Centre, the Roman Baths, and the Castle Museum—including a full-time stint in the year between my MA and PhD. I actually considered heritage as an alternative career possibility for several years towards the end of my BA and during the masters, but as a sector it’s facing a lot of similar challenges to academia (limited finances, few jobs) and so didn’t make for a very good back-up plan. I’d say that mostly the influence has gone the other way: I’ve looked for these supplementary positions because they were extensions of my interests in history and in the research process. It was useful, however, to have these moments where I had to step outside my study bubble and confront something else (both other disciplines and the public): it’s helped me be more self-aware of what I’m doing as a history researcher and teacher. The first thing I did after submission was cram in writing a postdoc application during the early hours of the morning over the course of the International Medievalist Congress at Kalamazoo… (I recommend it as a method, actually—conferences get you in the right zone to explain your research to others and sleep deprivation helps you not overthink it!) The later stages of that application process then kept me busy for much of the lead-up to my viva three months later, and I was hired before I had to defend, so that took some pressure off for the revision process: I concentrated on reviewing my thesis rather than trying to round out my reading, and I think in general that’s really the most important thing because a few extra weeks of work can’t hold a candle to 3-4 years of intensive study. In the end I didn’t have much of a break between my final submission and starting the postdoc, which I do regret a bit—I had been counting on having some time to mentally recoup and put some space between me and the thesis, but of course the trade-off has been well worth it. I’m currently in my second of four years as a postdoc on the ERC-funded project Lordship and the State, 1300-1600 at Ghent University (PI Frederik Buylaert, co-PI Justine Firnhaber-Baker). I think it’s an excitingly international project at this particular moment of, well, a turn towards national insularity around the globe; our historical material crosses between France, England, and the Low Countries, and this reflects the composition of the research team as well—it’s been a pleasure to engage with a new academic environment in this way. My research in all this takes a comparative look at how lordship worked in the north and south of France in the fourteenth century with an eventual interest in the decentralizing tendencies in early state-building, though for now I’m still at the “what even was lordship?” phase (turns out, it’s surprisingly complicated). It’s been a great follow-up to my PhD in that it’s allowed me to keep pushing at the issues I’m most interested in—power and who got to participate in it—but in a different context and using a different methodological angle, which has helped freshen things up after the PhD grind. My favorite part is definitely being able to travel around and work in different archives in Paris, Normandy, and Languedoc; I’m really gaining a better appreciation of the similarities and differences across various regions of medieval France. I’m also helping to supervise two PhD students, so that’s been an interesting reflective process for me, though also something of a sharp learning curve coming so soon after being a student myself. On the other hand, I’m currently in the midst of finishing up the monograph draft from my thesis as well as a critical edition of some legal texts, so these days I would mostly say that I’m finding it stressful, ask me again later this spring! I was lucky in that this postdoc came up at exactly the right time for me. I hadn’t actually yet begun looking at jobs post-PhD, but with a big push I was able to finish the thesis in time for the application deadline: so in the end it forced me to just wrap that project up and move on, for which in retrospect I’m quite grateful. As for the application itself, I found it hard at first to figure out how to build a research proposal within an already-established project, since history is so often a solitary discipline. The interview was devastating, really unlike anything I’ve done for non-academic jobs: the questions were so incisive and good at picking apart my research that once it was over I was absolutely certain that was the end of things. But I think that having that in-depth conversation actually helped give the project team some good integration right from the start (and obviously gives me a better idea of what to expect in the future). Since then, I should add, I’ve applied to one permanent position, though without luck; it was a North American application, which is an entirely different beast from what I’ve seen in Europe, so that’s been part of the learning process as well. On the whole, however, I’m keeping the job-hunting on the back burner while I can; I don’t want to diminish this current phase of my career by always looking to the next thing if that would come at the expense of getting the most out of my opportunities now. What’s the trickiest question you’ve ever been asked in a job interview? I think I’ve mostly blotted the details from my mind! I know I’ve struggled most, though, with questions where I can’t point to a concrete example from my research or experience: trying to discuss things in general terms doesn’t communicate very effectively and feeling that barrier going up while giving my answer just made things worse. By contrast, it’s easy to be enthusiastic about specific things you know you’ve done well, and easier on the interviewers too (after all, they really want to like your answer as much as you do). What advice could you give to ECRs looking for academic and research jobs? Don’t be discouraged by the qualifications list. I really hesitated to apply for my current position because I didn’t yet have that “track record of publications in leading journals” (or indeed, any publications at all), and was surprised when my supervisor didn’t think this was as big a deal as I did. Since then I’ve also been on the hiring end of a few positions, and there really haven’t been such clear make-or-break points in applications: the point isn’t to follow the template exactly (no two candidates are bringing exactly the same things to the table) but to offer what you’ve got. I think this advice is particularly important for women ECRs in light of the various recent studies that have shown that they’re less likely to apply for positions if they don’t feel they’re the perfect candidate on paper. You’ve got to pace yourself, of course—with the market the way it is, we have to be strategic in how we spend our efforts; but I think those choices should be driven by the positives. Research can be so hard on the body—everything from the strain of staring at a screen for hours and typing page after page, to just sitting all day in one spot, to breathing in truly horrifying amounts of parchment and paper dust at the archives… Remember to take care of yourself physically as well as mentally!